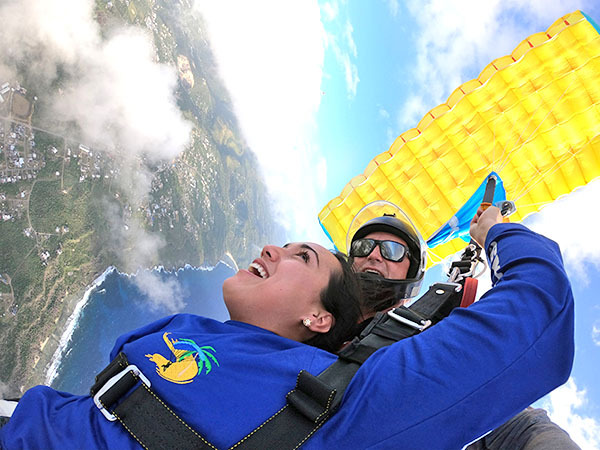 Hurling through the blue sky early Saturday morning, 2018 Miss Marianas Celine Cabrera said she will never forget the exhilaration of a brief free fall during her first tandem jump with Skydive Saipan. “It was amazing! I can’t really put in words, you have to try it for yourself. I saw Saipan in so many new ways, including the swirls of turquoise and dark blue in our ocean! It is an experience like no other and I am so grateful for the chance to do it,” said Cabrera. As a birthday gift to her, Skydive Saipan took Celine for her first tandem jump with Darin Quaile, Skydive Saipan chief tandem and safety examiner, and the young beauty queen was bubbling with excitement even after she landed safely on the Francisco C. Ada/Saipan International Airport field. “I touched a cloud! I tried to put in my pocket,” she laughed. Cabrera joined a dozen other thrill seekers and tourists who were happy to take photos with her as she wore her crown and sash before and after the tandem jump. Skydive Saipan takes the jump seriously, said Quaile who has done 20,000 jumps in a 20-year career, pointing out that it is a safe and rewarding experience. After reviewing safety procedures, Cabrera watched a video for further instructions, pulled a jumpsuit over her outfit, tied her hair and put on the safety goggles for the first few minutes of the dive. Soon, she joined Quaile who linked his safety harnesses to her and boarded the plane to fly thousands of feet above Saipan. Right at the airplane door, Cabrera and Quaile were the first out as the other four followed to complete the five-group tandem and were soon gracefully swirling in open parachutes to the field. “Everyone was so tiny! I could see the gorgeous sunrise, our newly green fields, beautiful ocean, even my house! Being up so high, I could see across to Managaha and to Tinian. Our islands are so beautiful and Saipan Skydive really gives us an opportunity to see it in a bigger, beautiful picture—it is truly an experience not to miss,” she said.